Walter Jon Williams' Deep State, out next week, picks up the themes of viral marketing and social media from his previous novel This Is Not A Game. And a lot of the stuff that Williams wrote about is very similar to what's been happening in Egypt and Tunisia. Is Williams a prophet of the internet age, or just lucky? Here's his take on what happened. As I watch the Egyptian demonstrations on CNN, I'm fascinated. A people-power revolution against an Arab autocrat was completely unknown until a couple weeks ago, when the Jasmine Revolution pitched Tunisia's Zine Ben Ali out of his luxe presidential office and into exile. As I write this, it seems as if another people-power revolution is on the verge of success in Egypt. I'm fascinated as I watch, but I am not surprised. I knew that this was going to happen. Oh, I didn't know it would happen in Egypt, or first in Tunisia. But I was very confident it would happen somewhere, sufficiently confident that I wrote the blueprint for this type of revolution in my novel, Deep State, which started appearing in stores just as insurrection exploded across Egypt. Very interesting timing, this. Once established, the Internet is like a river: it tends to flow around obstacles. The Chinese government has employs tens of thousands of civil servants to maintain what has been called the Great Firewall of China, its massive attempt to restrict information and discussion among Chinese. But any Chinese hacker worth his salt knows about proxy servers and software that will enable him to conceal his IP address, and that hacker will flow around the Great Wall to do his surfing and communication in near safety. Anyone with access to the Internet can find out what's going on around the world whether his government wants him to or not. Anyone who wants to keep their discussions and interests private has a very good chance of succeeding even against so formidable an obstacle as the Great Wall. The tools are there, ranging from Freenet to Tor to darknets. In Deep State, a small cabal of puppetmasters manipulate social media to organize a people-power revolt in a Middle Eastern autocracy — to "astroturf an entire country," as my protagonist Dagmar puts it. To cause a revolution, and to have the revolutionaries think it was all their own idea. "Man is by nature a social animal," as Aristotle says. "Society is something that precedes the individual." What Dagmar begins with is the realization that everyone is already networked. Everyone has friends they hang out with, old friends they see only every so often, loved ones, relations, third cousins twice removed, colleagues, political affiliates, religious affiliates, superiors, subordinates, fellow-hobbyists, fellow-readers . . . All those networks are basic. Social media adds additional networks, and makes it easier to communicate with the networks you might already have, but they didn't invent social networks. Those come as a given. Dagmar begins with these networks. Through electronic media, entire networks can be mobilized very rapidly and moved into place. Crowds can be assembled like flash mobs, before the authorities can properly react. Local police or military would be overwhelmed, and the insurgents can disperse before reinforcements arrive. 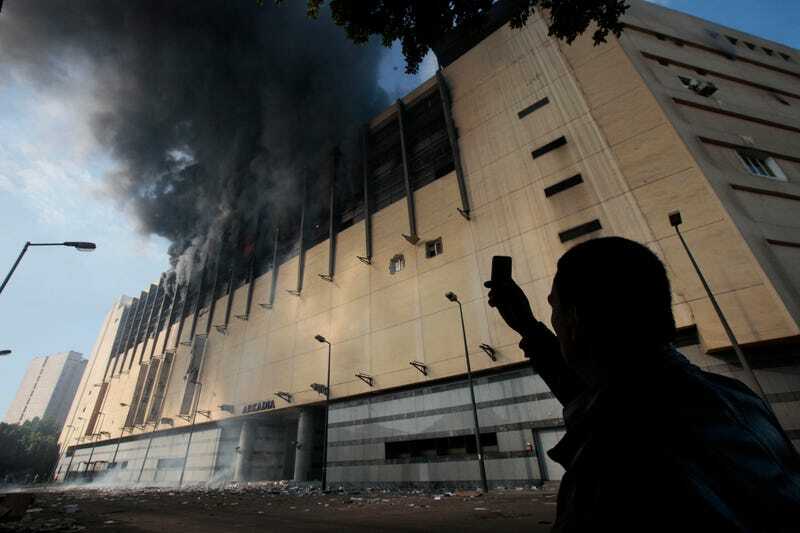 The revolution in Egypt began with a few people on Facebook announcing the times and places of demonstrations, then letting the information move along their networks, and their friends' networks, and the networks of their friends' friends, until it began to reach tens of thousands of people. The technical name for this is "open-source insurgency." It's very difficult for the authorities to cope with this kind of revolt once it gets moving. There are no leaders to arrest. There's no hierarchy to disrupt. If a network goes down, other overlapping networks remain intact. A successful people-power revolt utilizes a strategy that flows, like the Internet, around any likely opposition. For someone like me, who remembers Vietnam-era protestors gamely stapling mimeographed leaflets to power poles, the variety of methods by which insurgents can be mobilized is marvelous beyond belief: social media like Facebook, Twitter, SMS, phone, instant messaging, blogs, satellite phones, online bulletin boards, photos, Semacodes . . . I'm sure I've left some out. Plus- if you're worried about communications security- there is a wide variety of public-key encryption available, military grade for all intents and purposes, plus more exotic methods of hiding your messages, like steganography. Or you could write the whole thing in l33t and drive anyone trying to read it crazy. All this is terrific, as long as you have access to modern communications systems. But what happens when the authorities decide to turn off the Internet? After all, this has happened. In Iran, in Burma, in Tunisia and Egypt. In part, your response will depend on what parts of the communication grid goes down. If the Internet is down but cell phone networks are still up, you've still got very good communication. If the cell phones go down, you've got land lines. Of course, if you're used to high-speed Internet, finding a dial-up modem may prove a bit of a problem. (Dagmar had a fairly ingenious way of finding them.) And if you can't locate any, I've got a bunch of old modems in my closet- and if you're conducting an insurgency against a tyrant, you can have them for free. When the Internet goes down, you have to get creative, or get the boots on the ground. Old-fashioned knock-on-the-door tactics may be required. In Egypt, insurgents walk into neighborhoods and start shouting "Down with Mubarak!" When people come out of their homes, they are led to the site of the demonstration. For a government, though, turning off the Internet is pretty much the thermonuclear option. In just a couple of decades, the Internet has become such an integral part of the economy- and of government itself- that shutting it down is the equivalent of committing economic seppuku. You have to hope the insurgents run out of hope before the economy runs out of cash. In the meantime, I continue to watch the Earth-shaking drama played out in the Arab world. I have to keep reminding myself that I knew that it was going to happen, if not in Egypt, then in Belarus, or Syria, or Algeria, or China. I wrote the book about this, I think to myself.